The traditional incandescent mini string lights you love with an incredible selection of bulbs colors, spacing and wire lengths! Complete your backyard and event lighting with our superb selection of professional quality patio string lights! Globe string lights available in G30, G40 and G50 bulb sizes as well as popular wire colors and bulb finishes. C7/C9 string lights are the classic lights you love with modern upgrades you want! Find Incandescent or LED bulbs in popular hues! Choose commercial string lights in a vast selection of wire lengths, bulb colors and styles to enhance your larger light displays! Pathway lights are perfect event and holiday lights! Convenient kits in popular colors and styles for quick walkway lighting! It's no secret, we love the outdoors! Not only is being outside good for you, but some of the most lived in spaces in our homes are often our outdoor gathering areas. Memories are made during long spring and summer days spent in the backyard or garden, and evenings are just better when spent together watching the sunset from an outdoor deck, front porch or patio space. If you love your outdoor areas you've probably considered ways to illuminate your space to take advantage of the night time hours as well as the daylight. You might even have a few lanterns, candles or possibly even a string of patio lights already helping to brighten the space. Or, perhaps you're not sure what to do but you know you want at least a few outdoor lights. 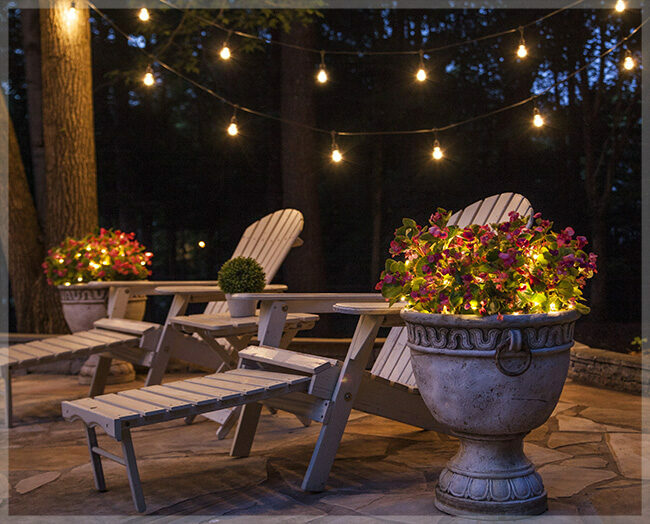 Whether you're just starting to plan your outdoor living space or want to refresh what's already in place, we've put together some of our favorite outdoor string lights & ideas to help you on your way to creating the most relaxing spot in the entire house! As a rule of thumb, LED lights generally produce a more rich & vivid color tone and have more bulb styles to choose from than their incandescent counterparts. There are also several different bulb styles to choose from in LED including faceted lenses and durable acrylic options whereas incandescent bulbs are more fragile due to their glass construction and have only a few finish options. In addition to visual differences, the choice between LED or incandescent lights often comes down to budget and the type of display. For long term projects, the extended life, energy efficiency and durability of LED lights is preferred. Because of their reduced power consumption, you can also plug more LED lights together which makes them great for large scale lighting across a backyard or outdoor event space. However, if you plan to hang just a few string lights periodically throughout the year or are working within a very small space & tight budget, incandescent lights might be just what you need. Smaller space = smaller bulbs. Mini lights and small globe lights (G30, G40 or G50) are best for small to medium sized spaces. LED lights are bright, so if you plan to use them in an area with close quarters you can get away with using less bulbs than you might if you choose incandescent bulbs. 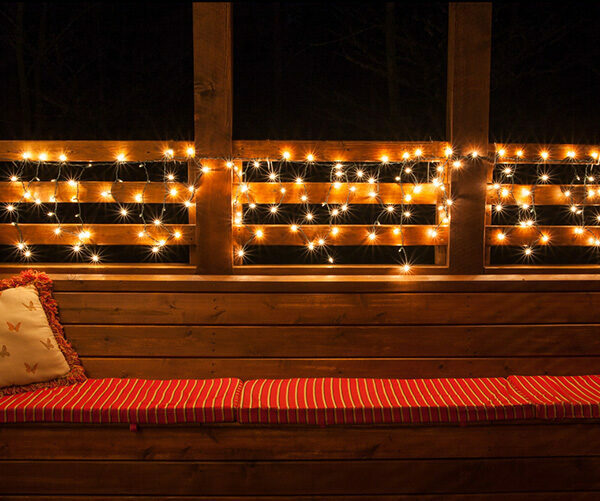 Balconies, decks and porches all have railings which are a perfect place for adding lights. The easiest way to light a railing is by wrapping it with mini lights, however if you love the look of globe lights but don't have a way to hang them above your space, you can drape a string of patio lights across the railings instead. Adhesive clips work well to hold patio lights in place temporarily across railings and screw-in hooks can provide a more permanent hanging solution. Icicle lights can also be hung across railings and down staircases - this type of light is especially popular for creating an elegant atmosphere at weddings and special events. If you have the ability to hang patio lights above your small outdoor area, it's best to keep lines simple with either a straight line of lights or two strings creating an X pattern above. For more information on patio lights hanging techniques visit our Ultimate Patio Lighting Guide. With large outdoor spaces there are many possibilities when it comes to the size of bulbs that can work in the space and how you can hang them. If the outdoor space you are planning to light includes railings or stairs, any of the methods mentioned in the small space lighting section above can still be used. For large spaces, you can still use small patio light bulbs, you just might need more of them to fill the space with enough light. You can also use much larger bulbs including large globe lights (G50-G125), or if you prefer a more traditional light bulb shape, A & S patio bulbs. The larger the bulb, the more spacing you can have between each socket and the fewer bulbs you'll need. How you hang the lights in a large space really depends on what natural features are available to hang them from. Do you have trees or other structures that you can attach the lights to and run them across your yard, patio or deck? If not, you may need to create some poles either by digging holes in the yard for posts, attaching wooden or metal beams to existing deck railings, or cementing a pole into a bucket or other sturdy container. Before you decide, consider drawing a rough sketch of the space and how you would like the patio lights to hang - don't forget to include measurements! A little planning prior to purchasing your lights will help ensure that installation goes smoothly. If you're not sure which lights to use or the best way to hang them in your area, send us a photo of the space on Facebook -we'd love to help! There are two more spaces we haven't yet addressed and these just might be our favorite little lighting secrets for year-round enjoyment! Most people consider walkway lights as lighting only for Christmas, but why? Gardens come alive beside the glow of pathway lights & guests are helped along their way as outdoor events stretch on into the evening hours. G40 and G50 globe lights or C7 and C9 bulbs make excellent pathway markers. Light stakes can be attached to each bulb to help keep them perfectly in place throughout any season. If you don't want to stake down every bulb or you're just looking for temporary outdoor lighting, place shepherds hooks along a walkway or landscape feature to hang those outdoor string lights in no time! Fencelines are another truly underappreciated outdoor feature when it comes to lighting. Think about it, they often border an entire yard or outdoor space and they're ready made for hanging lights. You can hang any outdoor string light you can image on a fence with no drilling, clips or tools of any kind required!